Property Location Rooney&apos;s Boutique Hotel is in the heart of Buenos Aires, walking distance from San Martin Cultural Center and Argentine National Congress. 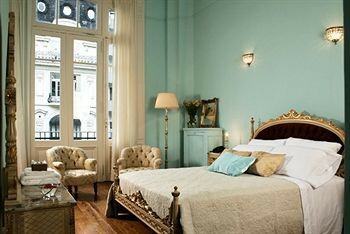 This romantic hotel is close to Obelisco and Teatro Colon.Rooms Make yourself at home in one of the 14 individually decorated guestrooms. Rooms have private balconies. Complimentary wired and wireless Internet access keeps you connected, and cable programming provides entertainment. Private bathrooms with shower/tub combinations feature deep soaking bathtubs and designer toiletries.Rec, Spa, Premium Amenities Make use of convenient amenities such as complimentary wireless Internet access, wedding services, and tour/ticket assistance. Guests can catch a ride to nearby destinations on the area shuttle (surcharge).Dining You can find a meal at a coffee shop/café serving guests of Rooney&apos;s Boutique Hotel, or stop in at a grocery/convenience store. Quench your thirst with your favorite drink at a bar/lounge. A complimentary continental breakfast is served daily.Business, Other Amenities Featured amenities include complimentary high-speed (wired) Internet access, limo/town car service, and a computer station. Planning an event in Buenos Aires? This hotel has facilities measuring 538 square feet (50 square meters), including a meeting room. For a surcharge, guests may use a roundtrip airport shuttle (available 24 hours) and a cruise ship terminal shuttle.